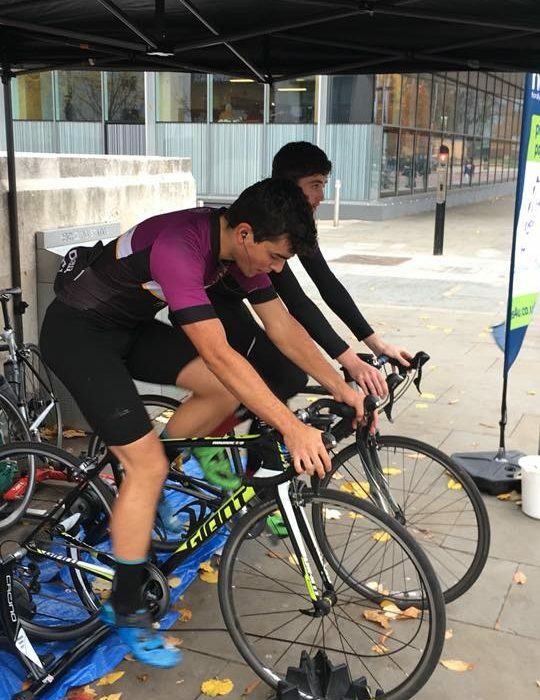 On Tuesday, 6th November, The University of Manchester Cycling Club began an epic challenge – a 24 hour static bike ride. Taking on the worst of Manchester’s rain and cold, the club braved the elements all in the name of charity. Around 20 members of the cycling club cycled in shifts. There were two people at any one time on two bikes outside the Students’ Union. These shifts meant the team was continuously cycling for 24 hours, beginning at 10am on Tuesday and finishing 10am Wednesday. So why do it? The club wants to raise a grand total of £2,500 this year for Maggie’s Centres. They are welcoming spaces that work alongside the NHS to provide emotional, practical, and social support to those with cancer and their loved ones. It costs £2,500 to run a centre for a day. They’ve run the event for a number of years now, but want this year to be their most successful yet. They’re hoping to raise a total of £800 from the 24 hour cycle alone. If you’d like to contribute to this total, their JustGiving page is still accepting donations. If this sounds like something you’d like to get involved in next year, why not join the Cycling Club? They welcome anybody, regardless of experience or ability. The club offers the chance to get involved in weekly mountain biking trips to Wales or the Peak District, weekly road biking sessions, and even opportunities for European training camps or weekend trips within the UK. Membership costs £40, and if you do want to join, check out their Facebook page.